Our Abpromise guarantee covers the use of ab58658 in the following tested applications. WB Use a concentration of 1 µg/ml. Predicted molecular weight: 203 kDa. RAI1 (retinoid-acid induced protein 1) may be involved in neuronal differentiation. RAI1 is highly similar to its mouse counterpart and is expressed at high levels mainly in neuronal tissues. RAI1 has a polymorphic polyglutamine tract in it's N-terminal domain. Expression of the mouse counterpart in neurons is induced by retinoic acid. The RAI1 gene is associated with both the severity of the phenotype and the response to medication in schizophrenic patients. Defects in RAI1 are a cause of Smith-Magenis syndrome (SMS). There are four named isoforms. Cytoplasmic and Nuclear. In neurons it is localized to neurites. ab58658 staining RAI1 (green) in murine N2a cells transfected with RAI1-HA wild type and mutant forms, by Immunocytochemistry/ Immunofluorescence. Cells were fixed with paraformaldehyde and permeabilized with 0.1% Triton X-100 in PBS. Samples were incubated with primary antibody (1/200). 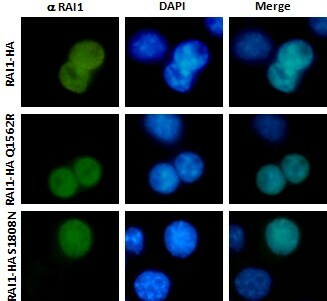 An AlexaFluor®488-conjugated anti-rabbit IgG (1/500) was used as the secondary antibody. Nuclei were stained with DAPI (blue). Publishing research using ab58658? Please let us know so that we can cite the reference in this datasheet. There are currently no Customer reviews or Questions for ab58658.